HECL Non Executive Trainee Admit Card 2019 is Released..!! The HECL Non Executive Trainee Admit Card 2019 is available now on this page. The Heavy Engineering Corporation Limited higher officials released the HEC Non Executive Trainee Hall Ticket 2019 on 18th February 2019 at the organization website. Candidates who had applied for Non-Executive Trainees (ITI Trainee, Personnel Trainee, Finance Trainee, Diploma Engineer Trainee) Posts, they have to attend for the written examination on the scheduled date along with the HEC Ltd Admit Card 2019. Candidates need to download the HEC Limited Non Executive Trainee Call Letter 2019 before the examination to skip last minute issues. Further information related to the HEC Ltd Admit Card 2019 mentioned in the below sections. The HECL Non Executive Trainee Admit Card 2019 link activated by the HECL authority at www.hecltd.com. Applicants need to download it by entering the login credential information. The HEC Ltd Admit Card 2019 is a mandatory document for the written examination. So all the applicants must carry the HECL Non Executive Trainee Admit Card 2019 at the time of attending the written test. The Admit Card contains information about the examination like exam date, name, time and venue. And also it maintains details about the applicant like candidate name, signature, and photograph. With the help of the HEC Limited Non Executive Trainee Hall Ticket 2019, the exam invigilator can easily identify the fake candidates in the examination hall. The HECL Non Executive Trainee Examination will be conducted by the Heavy Engineering Corporation Limited (HECL) officials in the month of February 2019 at various examination centers. Examination date clearly mentioned on the Admit Card. Candidates who had applied for Non-Executive (ITI Trainee, Personnel Trainee, Finance Trainee, Diploma Engineer Trainee) Posts, they should prepare well for the written examination without wasting the valuable time. Visit the official website of HECL at www.hecltd.com. Heavy Engineering Corporation Limited homepage will open. Find the HECL Non Executive Trainee Admit Card 2019 scrolling link on the main page. After that hit on that specific link. Now provide Registration ID, Birth Date and press on submit button. After that Hall Ticket will open on the screen. Take a copy of the Admit Card to carry for the examination hall. 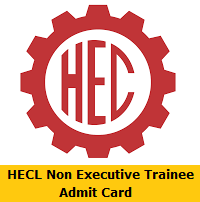 Hope the above provided information about HECL Non Executive Trainee Admit Card 2019 is handy for the candidates who had applied for Non-Executive (ITI Trainee, Personnel Trainee, Finance Trainee, Diploma Engineer Trainee) Posts. Many of the candidates searching for the HECL Non Executive Trainee Call Letter 2019. So aspirants can share this article with your friends too. For more details about all Government Job Recruitment, Syllabus, Previous Papers, Admit Card and Result details keep visiting Sarkari Recruitment frequently. Thank you.